The mask that specifies the file names of the objects to select or de-select. The mask can contain the "wildcards". (This area is not used with the Select All and Deselect All commands). If checked, this option causes the selected operation to be applied to files. (This area is not used with the Select All and Deselect All commands). 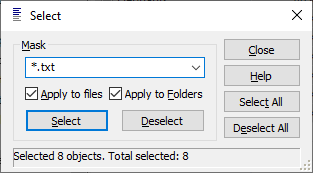 If checked, this option causes the selected operation to be applied to folders. (This area is not used with the Select All and Deselect All commands).